“Gentle forward movement” has been my guiding principle for many years, since I first discovered Ayurveda in 2008. It’s a doshic balancing mantra for me. Gentle, for my fiery (and sometimes overproducing) pitta energy; forward (as opposed to up), for my ethereal (and sometimes maniacal) vata energy; and movement for my earthbound (and sometimes longing-to-be-couch-bound) kapha energy. 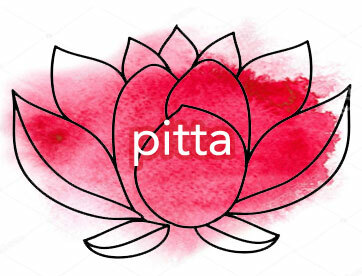 Pitta dosha is made up of fire and water and is the energy of transformation and digestion. This is true in our bodies and in our lives. When we eat, we need the fire in our belly to cook our food and send it properly through the digestive tract. Generally speaking, without pitta, we don’t digest and we have that heavy, food-is-lodged-in-my-stomach feeling*. * Pitta and agni are not the same thing, but that is for a later post. Stay tuned. So is true with what we digest outside of our gut. We digest experiences through all our senses: sight, sound, touch, smell, taste. With strong pitta, we can digest movies we see, news reports, the beautiful as well as the unpleasant. Our sense of taste is clear; we take in sounds without being overly disturbed by them. We digest all the world around us. Pitta in balance is the fire and the heat of productivity and clarity and forcefulness. Pittas are powerful and magnetic people. With enough pitta, we are leaders and we run companies and we keep the world running smoothly. With too much pitta, though, all of the senses get harsh. We overly-digest. We have hot, sour stomachs and our taste becomes bitter. Our personalities become critical and short. We are quick, just like our digestion, overly so. Our discernment becomes judgment and we get hotter and hotter believing we are righter and righter. Gentle is my pitta invocation. When pitta is reminded to be gentle, pitta can evoke the power and command that the personality type is most known for. Gentle is not weak, which pitta can sometimes be afraid of—being perceived as weak. Instead, Gentle is empowering. It’s a way of looking at the world that is the opposite of harsh. When pitta is reminded to be gentle, they are reminded to step back from the judgment and step into the discernment that is their superpower. Vata dosha is the energy of movement. Vata is made up of ether (space) and air and its inclination is to rise. Space itself is immobile. It waits patiently for the stuff of the world to move into it. Air is the quickest stuff to move into space. When there is only air and space, there is no ground. There is no transformation. There is only stark movement. Since vata is pure air and space, its qualities are dry, light, and rough. Anyone who has experienced a vata imbalance will recognize this feeling of stark movement. No ground associated with it. Not even a purpose. Moving for the sake of moving, swept up and exhausted but still unable to still oneself. This same person is also probably excessively dry in their skin, hair, bones. In balance, vata is the energy of creativity and joy and enthusiasm. Vata sees the world as something to be interacted with. It’s electric and inspiring to be around a balanced vata. Forward is my invocation for my vata energy. I want to harness the good qualities of movement and direct them forward, toward my goal, instead of into the ether where they will swirl and dance and get trapped in the vacuum of space. Movement is my invocation for kapha dosha. After reading about vata, you might think movement would match better there than here, but not so. For vata, movement needs to be directed and harnessed for its greater good. For kapha, mostly there just needs to be more movement. Kapha is made up of earth and water. Kapha is responsible for coherence, both in our bodies and in our lives. Kapha provides the lubrication for our joints and our digestive tract and all the areas of our body where there is something other than dryness. In our personalities, kapha is responsible for the nurturing, lubrication of the social sphere. Kapha will be the steady hub of the friendship circle. When a pitta may say something insensitive, even without meaning to, kapha will come in with a laugh so everyone will know it was not meant to be unkind. When a vata gets around a grounded kapha, sometimes vata energy can come down as well. Settle in and relax, be tethered so to speak. But when kapha is imbalanced, when too much earth is mixed with too much water, kapha gets muddy. In our bodies, the fluids don’t flow as easily as they should. We get sticky and slimy digestion. Imagine having mud in your joints instead of the juicy fluid that keeps you well-oiled. That’s too much kapha. Too much kapha also presents as excess weight. Too much earth, like a mountain or a mudslide, impossible to move. In our personalities, a kapha imbalance looks like depression, inertia, lethargy. It looks like hording and unwarranted attachment to things and people. In balance, kapha is loyal and dependable. Out of balance, kapha loyalty turns to stuckness similar to how pitta’s powerful discernment turns to ruthless judgment. Kapha will hold on to relationships that aren’t serving them. They will hold on to physical things in their homes and offices long past the time when effective discernment would have prompted them to let go. What kapha needs is movement. Not more air–as in, not more vata, but the water needs to be clear and flowing and the earth needs to be firm and holding. Mud is only good for bee stings and facial masks. My hope for my kapha is that movement be part of my every day. Movement of what I eat through my digestive tract, movement of my body with a little sweat involved (squeeze the water out a little), movement of ideas and things in my sphere so that I don’t feel stuck in any area. Prevention is easier for all three doshas than it is to restore once that harshness or flight into space or muddiness takes hold. Developing practices that encourage balance in one or all three doshas is key. Awareness — that judgment isn’t “better thinking” and activity to the point of exhaustion isn’t “better time management” and staying where you are when, objectively, you need to move, is not “rest” or “loyalty” — is the first step toward cultivating a healthy relationship with yourself. Once you are looking for ways to balance your imbalances, the ways will appear as if by magic. They’re there now. We all have health intuition that we can tap into. We just have to put on our perspecticles to see clearly. Cool down. Eat cooling food (not necessarily cold food) like yogurt and coconut water, and ease up off the spicy foods. Do cooling, calming movement like gentle yoga and swimming rather than hot, vinyasa yoga and ultramarathons. Pittas need not fear they will cool so much as to lose their superpower of productivity and command of the world. Not possible. Pittas need to cool off so that they can run the world and be fierce without being severe. Ground yourself. Come down to earth as a practice. Eat foods that are nurturing and solid like root vegetables and hearty soups. Ease up off the light, rough salads and dry crackers. Do warming, grounding exercises like restorative yin yoga and strength training rather than speedy vinyasa flow and sprints at the track. Vatas need not fear they will ground too much as to lose their superpower of creativity and motion. Not possible. Vatas need to slow down and harness their movement into a direction that serves them instead of feeling like they’re on a treadmill of moving nowhere useful. Lighten up. Reduce the amount of pure water and earth going in. Eat drier, lighter foods, like quinoa and vegetables, that will dry up the water and not produce more mass (earth). Ease up off the heavy meats and dairy. Do warming, lightening exercises like running, rebounding, or vinyasa flow yoga. Kaphas need not fear they will lighten up so much that they will lose their friendliness and ability to nurture. Not possible. Kaphas need to get up off the couch and let go of their tight grip so that the people and things that will truly benefit from their nurturing are the people and things they are filling their time and spaces with. Gentle forward movement is my trademark. As a vata-kapha, I still need all three. We all do. No matter what our base constitution, we can get an imbalance in any of the three doshas, and left unchecked, it will go deeper and deeper and become harder to fix. On any given day I may need more gentle or more forward or more movement, but there is never a day when I don’t need at least one. Even a plane on autopilot is constantly course correcting. Ayurveda, and health for that matter, is all about giving us the tools for the course correction so that we get to, or stay, somewhere near balance. Balance is our most powerful position. It is from a place of balance that we can truly move out into the world and do our work.